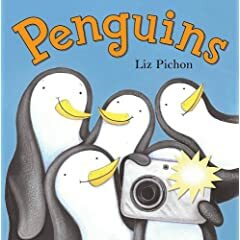 [New words in this book: activities, camera lens, grinning, waddle, amazing, developed]Listen to the interesting words in this book as I read it. Read the book. Early Literacy Aside--Example: Hearing new words in books helps your child learn lots of words and the more vocabulary they learn the more they will understand what they will read.